PUNTA GORDA/ENGLEWOOD BEACH, Fla. (November 15, 2016) – Today, the Punta Gorda/Englewood Beach Visitor & Convention Bureau announced Tourist Development Tax Revenues collected during Fiscal Year 2015-2016 (Oct. 1, 2015 – Sept. 30, 2016) exceeded Fiscal Year 2014-2015 by 6.28 percent. Nearly $3.8 million was collected in FY ’15-’16 and almost $3.6 million was collected the previous year. This is the most TDT Revenue Charlotte County has collected during a fiscal year since the Bureau’s inception in 1997. Each year, the Punta Gorda/Englewood Beach Visitor & Convention Bureau conducts marketing, sales and promotional campaigns to increase awareness of and visitation to Charlotte County. In addition to generating economic contributions, the Punta Gorda/Englewood Beach Visitor & Convention Bureau is also focused on developing ecotourism and soft adventure travel. These popular low-impact industries enable the county to preserve the invaluable natural resources that contribute to its ecological and economic health, while distinguishing the area and drawing visitors. During calendar year 2015, Charlotte County welcomed an estimated 395,800 visitors and tourism generated an estimated $345,067,400 in direct expenditures and made an estimated $526 million economic impact in Charlotte County. 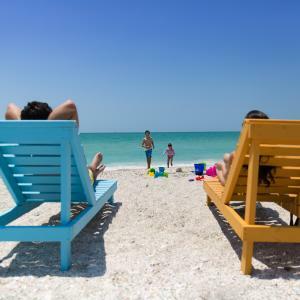 Located halfway between Tampa and Naples on the Southwest Florida Gulf Coast, Punta Gorda /Englewood Beach is a charming collection of nine coastal communities surrounding the state’s second largest harbor. Florida’s premier year-round eco-tourism destination, the area offers a pristine unspoiled beauty. In 2014, Port Charlotte was named the top “U.S. Best Value Destination” by Trivago (the world’s largest online hotel search site), and the Charlotte Sports Park, spring training home of the Tampa Bay Rays, was voted “Best Spring Training Facility” by readers of USA TODAY. A haven for outdoor enthusiasts, Charlotte Harbor in Punta Gorda / Englewood Beach has been named one of SAIL magazine’s “10 Greatest Places to Sail in the United States,” ranked by Golf Digest as “Third Best Place to Live and Play Golf in America,” and rated by MONEY magazine as one of the “Best Places to Live in the South.” Englewood was named second of the Top Ten emerging travel destinations in the U.S. by TripAdvisor.com. The area is served by five airports: The Punta Gorda Airport (PDG) with private and charter air service, Sarasota Bradenton International Airport (SRQ), Southwest Florida International Airport, Ft. Myers, (RSW), St. Petersburg-Clearwater International Airport (PIE) and Tampa International Airport (TPA). For more information on visiting Punta Gorda / Englewood Beach visit www.PureFlorida.com or call1-800-652-6090.